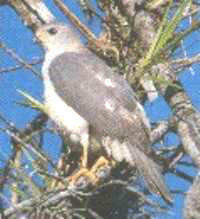 The Grey Goshawk hunts mainly mammals and large birds, in all forest types. A pure white plumage form occurs in all populations. In Tasmania all are white, but in north Queensland this form is scarce (about 15%). The female is much larger than the male and may be almost twice his weight. Hunting is mainly by stealth. It often pounces on prey from concealed perches. While nesting, the female has the larger share of incubation and brooding the young. The male does most of the hunting. During courtship, the male and female perform elaborate aerial displays. The main call is a shrill chatter or a repeated rising shrill whistle. The Grey Goshawk is resident in rainforests round Chambers Wildlife Rainforest Lodge . This handsome bird of prey is coloured a light grey, and when seen quickly or from a distance, appears quite pale. he Grey Goshawk may be a relatively common raptor, yet it's secretive nature makes it elusive. One may be able to catch glimpses of it flying above the canopy. It is probably easiest to see on the Atherton Tablelands, where it may occasionally be spotted perched on wires in farmland on the edge of the rainforest.